We all know that the way we view television is changing. In fact, between YouTube, Hulu, DVR backlists and Netflix, most of us barely watch actual TV at all. So if appointment programming is a thing of the past, what's next? You deserve nothing less than the seamless integration of all the content you want, be it Internet, apps or the latest episode of your favorite shows—all on one device. That's why, over the next weeks we'll be looking at all of the game-changing features of Sony Internet TV. 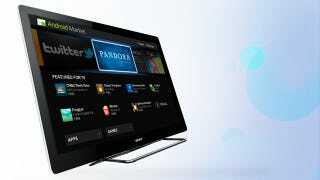 Google TV is just one of the many features of Sony Internet TV. Head here for more for more information on all of it's astounding abilities, and check back next week when we take a look at it's high powered Intel Atom processor.